Dr Jun Kimura from the Asia Research Centre at Murdoch University lecturing in the NAS Part 1 course in the Institute of Archaeology lecture theatre on Friday 30 November 2012 (photo by Mark Staniforth). The Nautical Archaeology Society (NAS) training project in Vietnam is designed to increase awareness at local, provincial and national levels about the extent and nature of Vietnam’s underwater and maritime cultural heritage as well as about underwater and maritime archaeology. 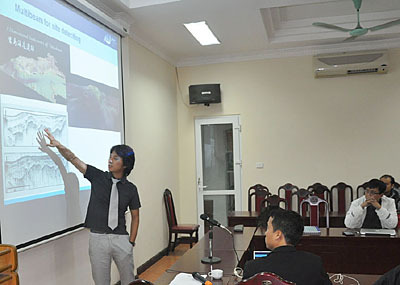 With the assistance of partners, sponsors and contributors, it is hoped that NAS training can be provided free of charge to Vietnamese students, government agency personnel, archaeologists and others in order to raise awareness about underwater cultural heritage and maritime archaeology in Vietnam, which will help Vietnam to preserve and protect its underwater cultural heritage. At this stage it has only been possible to arrange for the translation of three sessions (sessions 1 to 3) of the Introduction course into Vietnamese but it is hoped that a full and complete translation into Vietnamese will be possible in the future. The Underwater Cultural Heritage Training project in Vietnam is based on Article 21 in the UNESCO Convention on the Protection of Underwater Cultural Heritage (2001).